As discussed previously, meat eating is problematic in terms of the environment, animal welfare, and human health. One mechanism through which one of those concerns can be eliminated – and the others potentially mitigated – is to remove animals from the equation. This week saw the world’s first international conference on the industrial manufacture of meat. Arguably, that is what the beef, pork, and chicken industries already do but, in this case, the meat is to be grown in industrial bioreactors instead of inside animals that are subsequently killed. It should be noted from the outset that there are some problems that this approach absolutely will not solve. It will always take more energy to sustain a meat diet than a plant diet, whether that energy is going into cows or industrial processes. Similarly, large amounts of energy use associated with transportation and refrigeration would be undiminished in the face of in vitro meat production. Given that plants will probably always be a feedstock to the process, concerns about water and fossil fuel use in agriculture, as well as fertilizer and pesticide runoff, remain in place. That said, it is possible that vat grown meat could be marginally more efficient, since calories would not be directed towards growing skeletal or nervous systems. Big vats would also have a higher volume to surface area ratio than animals, making it less energy intensive to keep warm. The major problem vat-grown meat could solve is animal welfare, though that is probably the reason for avoiding meat that most people find least compelling. Even most vegetarians drink milk and eat eggs, most of which is produced under conditions equally awful for the animals. Arguably, vat grown meat would still be a kind of ethical violation – not because any animals suffer, per se, but because the whole concept is somehow monstrous and demeaning to nature. All told, this doesn’t seem like much of a solution. The way slaughterhouse animals exist already approximates the character of an industrial meat factory. There is also little reason to believe that firms that happily feed all manner of drugs and hormones to animals would not similarly manipulate huge tanks full of artificial fat and muscle. As such, any hygienic concerns about factory farmed animals would probably translate readily to vat-grown meat. The relevance of any of this is fairly questionable, given that vats are currently capable of producing the very lowest quality kind of meat (fodder for ground meat and nuggets) and can only do so at a financial cost higher than industrial agriculture. For all intents and purposes, we have already built industrial bioreactors on the skeletons of livestock. Shifting those to steel drums, as an alternative, will only make sense if the economics swing strongly in that direction for some reason. Meat eating is problematic in terms of the environment, animal welfare, and human health. But it is even good in some cases as it cures many of the diseases. Most of the medicines are made of animal fat and how can one destroy animals? What’s the story behind today’s photo? That was a huge pro-China protest in front of Parliament that took place over the weekend. This photo is actually quite misleading, because the little pocket of pro-Tibet protestors are at the front. The vast majority of the 2000 or so people on Parliament Hill were protesting attempts to ‘politicize’ the Olympics. Industrial meat has another purpose which you mention only by implication: it makes explicit what is implicit in industrial farming today. Already we deprive the production of meat from any of the human meaning it once had by turning animals into “livestock”, indistinguishable formally from any other form of perishable stock. Whereas before what was distinctive about a particular animal gave it its character, now every difference is merely an obstacle to be overcome on the way to infinite producibility. In vat growing, those differences are overcome more completely. I recently posted an entry on why the notion of “attempts to politicize” the olympics are fundamentally misled – the Olympics have always been a political venture since their beginning in 1896. Countries vie to host them because it is a source of prestige, and as Rex Murphy (who seems to have a the right view on this issue) says, countries count olympic gold and silver more jealously than they count their economic wealth. “Now look at Tibet on the population density and terrain maps. On the terrain map one sees the high mountain passes of the Himalayas. Running from the Hindu Kush on the border with Pakistan to the Myanmar border, small groups can traverse this terrain, but no major army is going to thrust across this border in either direction. Supplying a major force through these mountains is impossible. From a military point of view, it is a solid wall. Note that running along the frontier directly south of this border is one of the largest population concentrations in the world. If China were to withdraw from Tibet, and there were no military hindrance to population movement, Beijing fears this population could migrate into Tibet. If there were such a migration, Tibet could turn into an extension of India and, over time, become a potential beachhead for Indian power. If that were to happen, India’s strategic frontier would directly abut Sichuan and Yunnan — the Chinese heartland. By 8 a.m. April 9, the pro-China demonstrators were taking up positions along the planned torch relay route, pulling in groups carrying Chinese, U.S. and Olympic flags, and equipped with cases of food and water. However, these were not spontaneous gatherings of overseas Chinese supporting the motherland, as Beijing media have portrayed them. Rather, there was a coordinated effort between local Chinese business and social associations and the consulate to attract, equip, deploy and coordinate the large pro-China turnout. 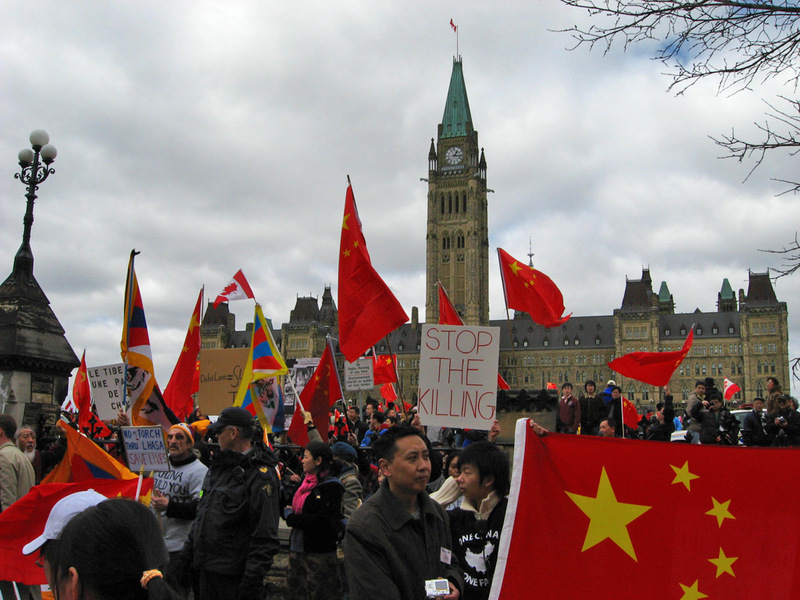 This is in contrast to the Free Tibet, Save Darfur and other anti-China protesters — who often seemed disorganized. By some estimates, as many as 50 busloads of Chinese from other parts of California were brought to San Francisco. Many of them paid (by some accounts $300 each) to come out for the day in support of Beijing. They were placed in groups along the anticipated torch relay route and given Chinese and Olympic flags, as well as American flags (the latter a tactical move to show they were not anti-U.S., but rather pro-China — a distinction made all the more apparent by the fact that most anti-China protesters did not carry U.S. flags, and some also were critical of the U.S. government). I agree that in the short term it’s difficult to imagine this technology making much difference to anyone – the financial and energy costs and health concerns will make it unfeasible for a good long time. In the long term though, I find it difficult to imagine that – assuming we survive the environmental disaster and rise of the intelligent machines bent on destroying their creators – we won’t end up manufacturing all our meat in this way for ethical reasons. Our ability to treat others (and this includes animals) morally grows with our wealth and stability (which is not at all to say that wealthier people or societies are more moral, just that they are in a position to be more so). If you could make vat grown steak that tasted just as good as real steak and you could afford it, why wouldn’t you? And in principle, as scientific knowledge grows, we should be able to make better vat grown steaks than real steaks. Bored MPA writes “The Times reports that PETA is to announce plans on Monday for a $1 million prize to the “first person to come up with a method to produce commercially viable quantities of in vitro meat at competitive prices by 2012.” PETA founder Ingrid Newkirk addressed the controversial decision by saying, “We don’t mind taking uncomfortable positions if it means that fewer animals suffer.” An unexpected and pragmatic move from an organization that has a strong base of support from pro-organic vegans.” The question I always had about this- if they can take one sample from one animal and clone it in a vat and feed this world, will the vegans be ok with that? So what’s wrong with the PETA prize? You need to sell your product in order to win. According to the contest guidelines (PDF), the million-dollar meat must be available in stores to qualify for the cash. Fake-chicken entrepreneurs have to demonstrate a “commercial sales minimum” at a “comparable market price”; in plain English, they need to move 2,000 pounds of the stuff at supermarkets and chain restaurants spread out across 10 states during a period of three months. And the Franken-meat can’t cost more than regular chicken. That means PETA won’t be content with any intermediate (and not immediately profitable) breakthrough, like the development of lab-grown chicken that tastes as good as the natural stuff. Instead, the organization will hold the purse until a “commercially viable” product hits the market. In other words, you can’t win the $1 million unless you’re already in position to make a profit. At that point, a science prize doesn’t provide much incentive for innovation. It’s more like a small bonus. *hands on head* “But it’s not natural”… This is the overwhelming criticism I expect to hear concerning Vat Grown meat, I highly expect the “It’s Not Natural” squad will also look for all kinds of scare crow reasons to ban it too. A bunch of froot loop idiots think that natural is automatically better, and that anything not natural is bad. Yes these people are idiots, but they’re wide spread idiots. You know Vat grown food in general is a good idea because it means we don’t have to suffer massive death tolls to starvation during events such as ice ages and droughts. Vat grown meat would still require nutrients to grow, which would need to be farmed using sunlight. As such, it might not offer meaningful protection from droughts or ice ages. Also, it would require the maintenance of an industrial infrastructure: something rather more complex to do in challenging times than to keep some goats or chickens alive. Philosopher Adam Shriver suggested that genetically engineering cows to feel no pain could be an acceptable alternative to eliminating factory farming in a paper published in Neuroscience. Work by neuroscientist Zhou-Feng Chen at Washington University may turn Shriver’s suggestion a reality. Chen has been working on identifying the genes that control “affective” pain, the unpleasantness part of a painful sensation. He has managed to isolate a gene called P311, and has found that mice who do not have P311 don’t have negative associations with pain, although they do react negatively to heat and pressure. This could end much of the concern about cruel farming practices, but unfortunately still leaves my design for the fiery hamburger punch in the unethical column. If I was being farmed for meat, and I had the choice between pre-industrial farming practices with pain, or being in a feedlot without pain, I don’t think the decision would be difficult. The ‘no pain cows’ have a definite Oryx and Crake quality to them. First, it is a weird subversion of a key biological response. Secondly, it would make them require a lot more human care. They would probably die a lot from not discontinuing damaging activities. Even more expensive debeaking-type procedures would probably be required. Of course, the alternatives open to animals aren’t pre-industrial pastoralism versus factory farms without pain. More like factory farms with pain versus factory farms without. Personally, I doubt we have the technological capability to remove such a deeply ingrained response from animals, though that is secondary to the ethical considerations. I don’t understand what you mean that some alternatives “aren’t open”. No alternatives are open to slaves, especially not ones concerning things that happen to them before they are born. But we can create situations which, given alternatives, they might choose. It’s entirely possible to end factory farming, and maintain only something like 1 to 2% of current meat production on pastoral farms. We need to adjust the types of meat we are eating. If we traded in feed lots for growing tilapia, trout, catfish, arctic char we could all eat good fresh animal protein and also be a lot healthier. All these aquaculture species have minimal environmental impact being raised in contained ponds and can very effeiciently convert feed to biomass. Its a trend that is already happening and I expect will keep on the rise. Besides powdered egg and breadcrumbs (for binding) and beetroot juice and saffron (to enhance colour), the patty was composed entirely of cultured muscle cells. To make it, Dr Post began with stem cells taken from two live cows (a Blanc Bleu Belge and a Blonde d’Aquitaine). He multiplied these cells a trillionfold and then merged them into myotubes (in essence, artificial muscle fibres), each less than 3mm long. This done, he wrapped the myotubes around hubs of agarose, a gel-like polymer extracted from seaweed, and fed them a diet of amino acids, sugars and fats (all derived from plants) to make them big and strong. The result was a far cry from a Porterhouse or a fillet steak. Cultivating something like that would mean growing the cells into big three-dimensional structures—which would in turn entail delivering nutrients deep inside the tissue. To do so would require blood vessels or some artificial equivalent. A real steak would also contain fat cells, the absence of which explained the lack of juiciness. Such cells are harder to culture than muscle. Dr Post and his team are working on both these points. Carnivores should cheer. The world’s appetite for meat is forecast to rise by 70% by 2050. Nearly a third of the world’s ice-free land is already used to raise livestock or grow fodder for these animals. Without a radical technological shift the new demand will be hard to satisfy. Vegetarians, too, have reason to egg Dr Post on. A single sample of stem cells could, he reckons, yield 20,000 tonnes of “cultured beef”. This is enough to make 175m quarter-pounders, a number that would require 440,000 cattle to be slaughtered.